>> How To Make Your Trampoline Bouncier Than Before? Trampolines are used by adults as well as kids for fitness, sports, and recreation. Bouncing on a trampoline helps in relieving depression and also possesses a number of health benefits. If you do not have the time lux to exercise on a regular basis, you can bounce on the trampoline for 10 to 15 minutes and get rid of the toxins from your body. Moreover, if you have any kind of joint problem, bouncing on the trampoline will provide immense relief from the pain that you are suffering for days. Trampolines also help in boosting the immunity of the body and makes you fit and strong. Whether you are an athlete or a cheerleader or a normal person who loves jumping on the trampoline, it is true that you would love to bounce higher and higher. There are few important adjustments that you can make if you want to make your trampoline bouncier than before. Certain things have to be cached in mind when you are interested in increasing the bounce of your trampoline. Most people love jumping on a Trampoline that is extremely bouncy because they get a feeling of freedom and weightlessness. The trampolines that you have purchased just a few days back will take time to become bouncy. But, with a few tricks and adjustments, you can make it bounce from the start. The trampolines are bouncy because of the springs that are attached to them. Springs act as the rubber bands which help in increasing the bounce. When you are jumping on your trampoline, the springs are going to stretch out, store your kinetic energy, and then this kinetic energy will be used for launching you back to the air. In order to make the trampoline more bouncy, you can add more springs. Replacing the springs is also an important step towards making your trampoline bouncy. If your trampoline has been exposed to harsh weather conditions, there are chances of your springs rusting. This decreases the bounce of the trampoline as the springs cannot stretch much. It is your duty to check the conditions of your springs. Check for the lost elasticity of the spring. This happens when your kid or you have used the trampoline for a long period, without giving it any rest. Look for the broken or cracked springs. Though there are many strings on a trampoline, even a single broken spring can reduce the bounce and poses safety hazards. Rust causes the springs to lose the elasticity. In these conditions, it is necessary to replace the springs with the new ones. This will help in bringing back the lost bounce to your trampoline. X Pattern: Crossing the trampoline springs can also help in increasing the bounce to a great extent. The excellent part about this approach is that you do not have to purchase any extra springs for this. All you got to do is arranging each spring in a pair of two in a manner that they overlap over each other and form an X.
V Pattern: You can also try the V pattern of attaching the springs. In order to do this, you have to leave the springs attached with their respective slots on the sampling frame. However, you have to use the alternative rungs for attaching the springs to the jumping mat. This means that every alternative rung of the jumping mat will have two springs attached, and create a V shape. W Pattern: You can also opt for the W pattern. This pattern will require you to buy few extra springs, but this is known to offer the best bounce to your trampoline. Every alternative third rung of the jumping mat will have three springs attached. The rest of the rungs should have two springs attached. If done correctly, then you will get a W shape. This arrangement of the springs helps in increasing the bounce of your trampoline. You can purchase the anchor kits which will allow you to add the additional springs around your trampoline. Your trampoline normally comes with 84 springs, but if you want, you can increase the number of springs to make the trampoline bouncier. A few additional things that you should keep in mind when you are bouncing on a trampoline should also be considered. Try to purchase a large trampoline which generates more bounce as the trampoline will provide a greater recoil. Instead of jumping at the edges of a trampoline, try to bounce in the center. This will help in lifting you more than it normally does. 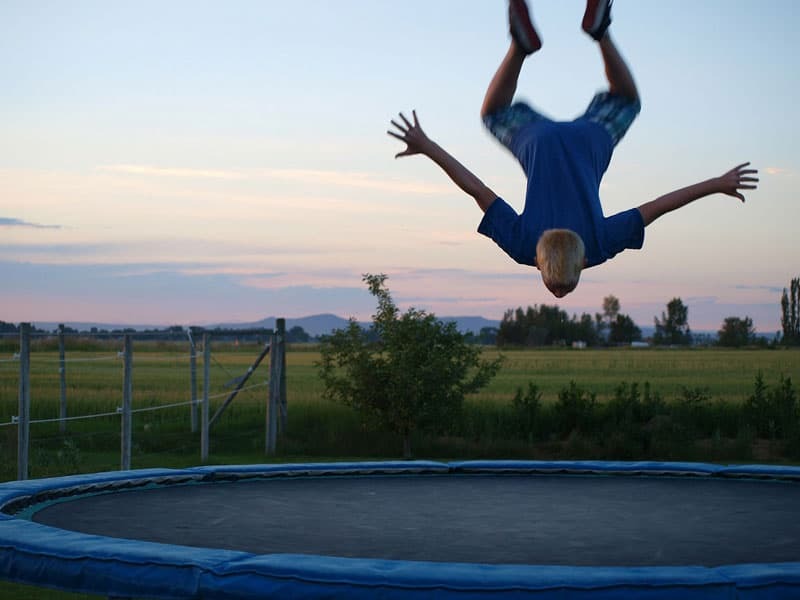 Instead of laying back on the trampoline, land on your feet to generate more bounce. A bouncier trampoline will help in doubling your fun and excitement. Follow the steps that are given above, and you will be able to make the trampoline in your backyard bouncy.